Niagara Falls is one of those places that drastically change from season to season. Real adventurers will want to visit the Falls in the winter when they are practically frozen over. 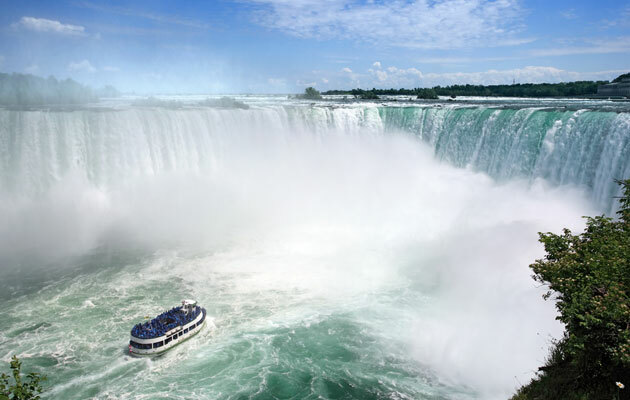 On the other hand, seeing the Falls in the summer, taking a boat tour into the heart of the world-famous natural wonder, bringing the kids for a fun day outdoors, or exploring the Niagara wine region with friends are just some of the activities that are available from May to October. If you are looking to have some family fun, make sure you visit Marineland of Canada, where you will be entertained by dolphins walruses, sea lions and beluga whales. If you are looking for a romantic weekend getaway, have dinner in one of the nearby fine restaurants overlooking the illuminated Falls or try your luck at Fallsview Casino in the wee hours of the night. When visiting the Falls in the summer, make sure to check out Niagara-on-the-Lake, a small town where the Niagara River meets Lake Ontario, famous for its wineries, historical sites and golf courses. Icewine is a type of wine that made this region famous, and it is essentially wine made from naturally frozen grapes picked at -8° C or lower, which you definitely don’t want to miss.